Helloww, it's time for another Weekly Mask review ! So anyway, I tried to use a sheet mask at least once a week but sometimes I get too busy or just plain lazy (;p) so I often skipped my weekly face mask routine. But I do give my best to use up my sheet mask so that I can empty my sheet masks piles soon. So this is a sheet mask pack that I used quite often for the past few months. This is another Korean product from the brand No:HJ and I got it from 0.8 L Indonesia. It is a mask pack containing 10 sheet mask in a unique shape resembling a "diary book". Containing hyaluronic acid which is great for hydration and anti-aging. It also contains Ceramide, Witch hazel extracts, and other plant essences that gives moisture and nutrition to the skin, as well as maintaining elasticity of the skin. First of all, as I already told you above, this sheet mask comes in really cute packaging, which is one of the most exciting part of this sheet mask. I love how Korean product mostly come in cute or unique packaging like this ! As you can see on the pictures it came in a shape that resemble a book, made of hard carton and comes with it's own pink strap! 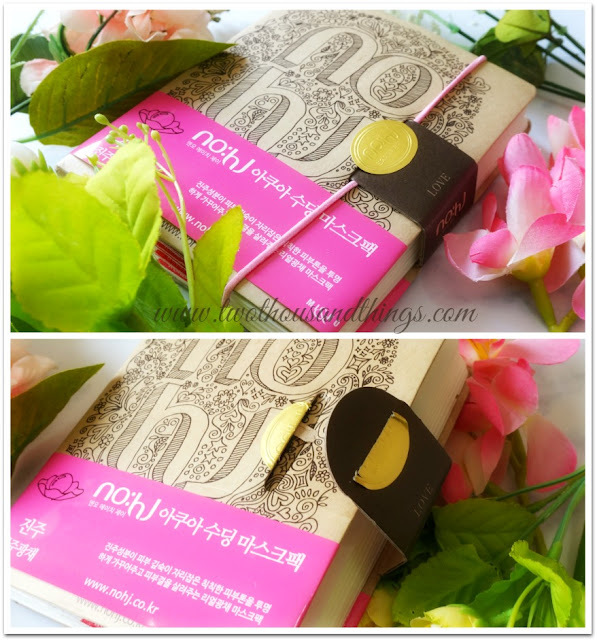 Inside it you will find 10 individual sheet masks which you can use anytime you want. Aside from the outer "book-shaped" carton packaging, I also love the design of the individual sheet masks packaging inside. Unfortunately there was no English language anywhere in this product so I had to browse around for details and information. After opening the packaging the material of the sheet mask inside is actually very thin. Probably the thinnest sheet mask I've ever tried. It is actually made of nature-derived cellulose tencel material that is more "earth-friendly" than its peers. I actually didn't like the super thin sheet because it makes it harder to use. Just like all the other sheet masks out there the mask came in folded shape inside the sheet packaging so we have to open the folded sheet first before using it on our face. The super thin texture of this No:Hj sheet mask combined with the super wet essence just makes it harder to unfold because it adheres very tightly. So it always caused a bit of a hassle whenever I have to unfold the sheet mask because I have to unfold it very very cautiously or else I will tear the sheet (just like I did the first time I used this). The essence inside is not abundant but it's enough for your skin to absorb. The sheet mask sits comfortably in my face without any essence drip. It also didn't feel as cooling as most other sheet masks but it's very moisturizing and soothing on the skin. This sheet mask makes my face feels very hydrated afterwards. Probably because of the hyaluronic ingredient which is known for retaining moisture, therefore it gives your skin hydration and elasticity. Great for anti-aging too! Have you tried No:Hj sheet masks before ? To see my previous Weekly Face Mask post, click HERE. [Outfit Diary] : Colorful Feats !